American style family reatuarant on the second floor of Victoria Square.The food is cheap and great. Have you got Google Earth on your computer? If so, then download the Google Earth Map of Spur Steak & Grill. 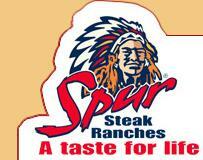 Is this the wrong position for Spur Steak & Grill? If you think so, then modify its position. first time visited to spur steak grill.food soooooo good,we had steak mm and ribs, best i ever had.staff sooo very nice, friendly,i would go as to say service excellent. and defo will go back.cant wait.also great for kids 2. Went for the burger specials, 2 for the price of 1 and with free mineral refills excellent value. Service very quick and polite, food excellent. Been here a few times and will be back. Kids love it! In a last-minute attempt to get some quick easy food, a couple of friends and myself decided the food looked good and it was mexican night so why not get some sangria?! Where to begin...the service seemed good... there was no fruit for the sangria so that was the first disappointment of the evening but the waitress was very apologetic about it and told us the cocktail specials. Happy enough. An hour later and there was a lady walking over with our food. Hallelujah! But it was the wrong order. Instead of apologizing for the lengthy wait, and apologizing the waitress informed us that that was in fact what we ordered and we were wrong! For some reason the person who took our order thought that my friend and I ordered two main meals each. Fajita's and enchilada's! They took one of each away and still left us with what we didn't order. It was an 'eat now or starve for another hour' moment so we ate what we were given. I did of course voice this. This was greeted by getting another two waitresses over to discuss how it was 'pretty much the same'. I have never experienced such bad service in my life. The food was mediocre and the wait was ridiculous! I would seriously discourage anyone from eating in this establishment and I would seriously encourage them to re-evaluate their staff! Disgrace. Great fast friendly service. Kids play room fantastic. Food is just terrible......terrible awful stuff. Not cheap either. Food is frozen dirt, playroom is excellent idea. Ribs here require razor teeth, its like chewing on a burnt wild boar that has been dug up from the artic. been there twice food its very very nice esp the steak sandwich plan on going again very soon for another one. service was diffently with a smile. recommend it for any function. plan on having a meal there for may friends birthday later this month. I thought it was brilliant. The games room was great for kids and the food was excellent. The waiter was lovely and very helpful. There was no wait to get a table, hardly any wait to get served and it was a very enjoyable experience. I would give it 9 out of 10. BURGER SIZE PUNY COMPARED TO THE BUN AND MEAT BURNT. ON ANOTHER VISIT(AM SOUTH AFRICAN - SO ANOTHER CHANCE) NOT AGAIN IN A LONG WHILE - STEAK STRINGY/FIBROUS - SAME EXPERIENCE IN SEVERAL SPURS IN SOUTH AFRICA - DEFINITELY NOT A STEAK PLACE. Absolutely awful. One of worst dining experiences ever. Decided to go here because one of my group (4 of us) fancied a steak. I assumed it would be like a TFI Fridays. Our experience started with a 15 minute wait for a table. When finally seated, we took off our coats about to get comfortable. The breeze from the opening door meant this did not last long. Then they did not have any steak left. WHAT!!!?? The starter took about 20 minutes to arrive. And only seemed to turn up as we were about to leave. All of it was awful. We reminded them we still had not had drinks. 10 minutes later- still no drinks. The main courses were nothing special either. The salad was saggy - not fresh. You will get better quality food and value for money at McDonalds (next door).....I am not exagerating. It is all pre-made frozen food that lazy uncreative chefs are simply throwing into an oven or fryer and then slopping it on your plate. They do not have a clue. The experience ruined our whole day. DO NOT WASTE YOUR TIME AND MONEY HERE!!! Visited on St Paddy's Day 2008. Obiviously a bad ides - as they had run out of most things. Ordered steak sandwiches 9 (for 2) and chilli nachos. After a 45 min wait, we got the 2 steak meals, no sign of the nachos. Had to send the steaks back as they were totally inedible, just pure gristle and luke-warm. Nachos were good. Replaced steak with chicken, was ok but not worth the price of the steak, which they still charged us for. Hopefully these are just teething problems, but I won't hurry back!